JERUSALEM - An Israeli official says three suspects in the vigilante-style killing of a Palestinian teenager have confessed to the crime. The official says the suspects on Monday were re-enacting the killing of Mohammed Abu Khdeir for authorities. The 16-year-old Palestinian was abducted near his home last week, and his charred remains were found in a Jerusalem forest. Preliminary autopsy results found he was still alive when he was set on fire. Israel on Sunday announced the arrests of six Jewish males in Abu Khdeir's death. Their identities have not been released, and the official spoke on condition of anonymity because the investigation was continuing. Abu Khdeir's death triggered several days of violent protests in Arab areas of Jerusalem and northern Israel. Israeli Prime Minister Benjamin Netanyahu phoned the Abu Khdeir's father to say he was shocked by the boy's abhorrent murder, and promised justice. "We will not allow extremists, it doesn't matter from which side, to inflame the region and cause bloodshed," Netanyahu said in a nationally televised statement. "Murder is murder, incitement is incitement, and we will respond aggressively to both." The region has been on edge since three Israeli teens - one, Naftali Fraenkel, a U.S. citizen -- were kidnapped while hitchhiking in the West Bank last month. Last week, the teens' bodies were found in a West Bank field in a crime Israel blamed on the militant group Hamas. In East Jerusalem, Mohammed Abu Khdeir's cousin, 15-year-old Palestinian-American Tariq Abu Khdeir, was welcomed back home after he received a brutal beating and four days in detention. The assault, he says, happened when he was caught up in the middle of last week's riots. "They picked me up and dropped me on my head, and started beating me, brutally," Khdeir told CBS News correspondent Alex Ortiz. He described his face being kicked and punched. "They didn't stop. They were carrying me and still kicking me and punching me, even when I was unconscious." Khdeir also talked about his murdered cousin, Mohammed: "I can still remember his voice in my head. It's like he's still here. Just that like nobody can see him." Tariq's parents said they plan on returning to where they live in Florida with their son on July 16. State Department spokeswoman Jen Psaki said that "if the investigation is concluded promptly, Mr. Khdeir should be able to return to Florida as planned with his family later this month." Other cousins of Abu Khdeir are still imprisoned, he said. He said he believed they are still detained because they -- unlike Abu Khdeir -- are not American. The State Department said it is "profoundly troubled" by Tariq Abu Khdeir's treatment while in custody, and has called for a speedy investigation and "full accountability" for those involved. Adding to the tensions, Gaza militants have been bombarding Israeli with daily rocket fire, drawing Israeli airstrikes in retaliation. Early Monday, the Hamas militant group said a total of nine militants were killed in fighting, including seven Hamas members, making it the bloodiest day of fighting so far. The group vowed revenge. 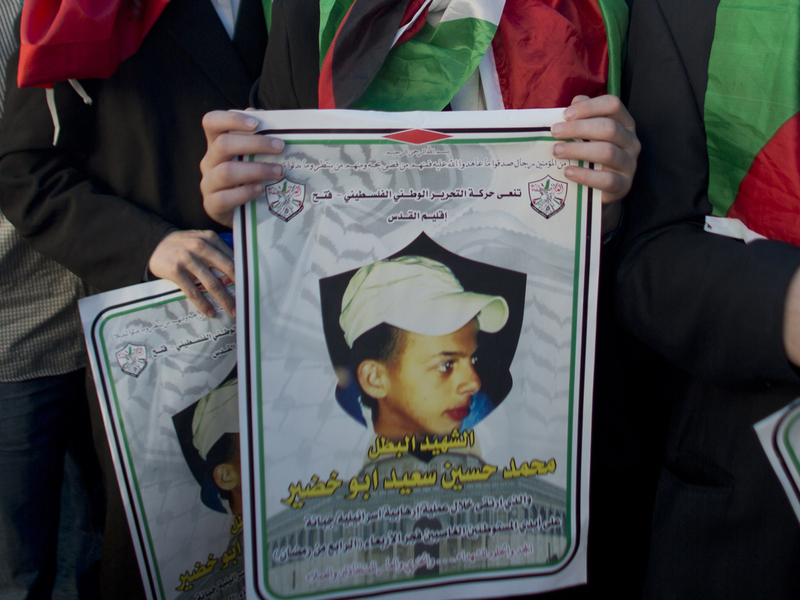 Palestinians immediately accused Israeli extremists of killing Mohammed Abu Khdeir in revenge. And on Sunday, Israeli authorities said the killers had acted out of "nationalistic" motives. "I don't have any peace in my heart, even if they captured who they say killed my son," said his mother, Suha. "They're only going to ask them questions and then release them. What's the point?" After the Israeli teenagers were found dead, several hundred Jewish extremists had marched through downtown Jerusalem calling for "death to Arabs." Social media sites were also flooded with calls for vengeance. Justice Minister Tzipi Livni said her ministry is investigating some of the anti-Arab incitement seen on Facebook last week. "These things need to be cut when they are small," she told Channel 2 TV. "At this moment, everybody's job should be to lower the flames." Cabinet minister Jacob Peri, a former head of the Shin Bet security agency, said he had met with Arab leaders in northern Israel to calm tensions. President Shimon Peres, a Nobel peace laureate, also was in contact with Arab leaders. About 50 people were arrested in several days of demonstrations following Abu Khdeir's death, and 15 police officers and two civilians were injured, authorities said.